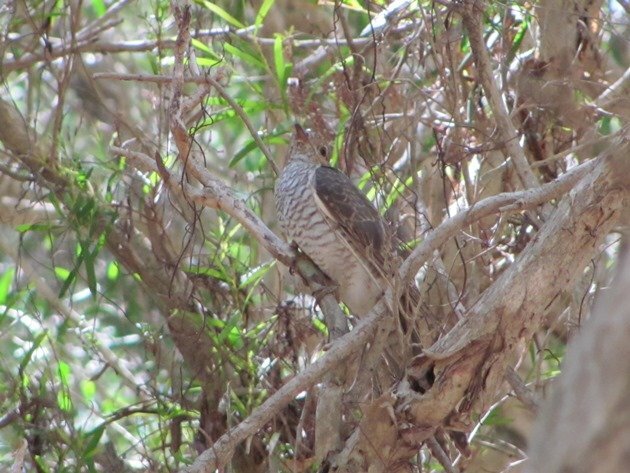 Over the past few months we have had a variety of Cuckoos calling and looking for a mate and the sound of any Cuckoo in Australia is completely different to the European Cuckoo. 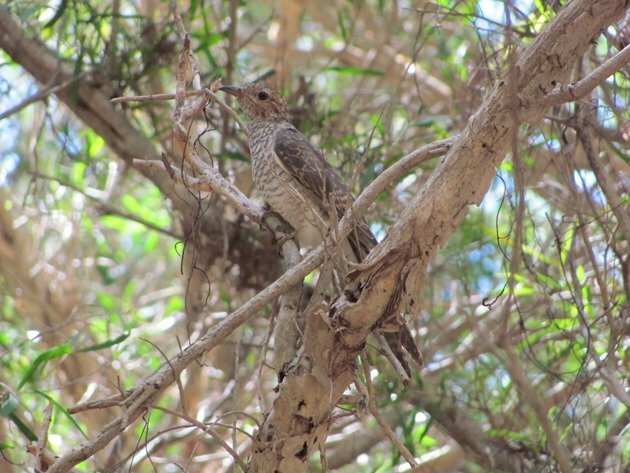 The Cuckoos in Australia call shrilly and in a frantic descending or ascending call and often you will only hear the variety of species and not actually observe them. 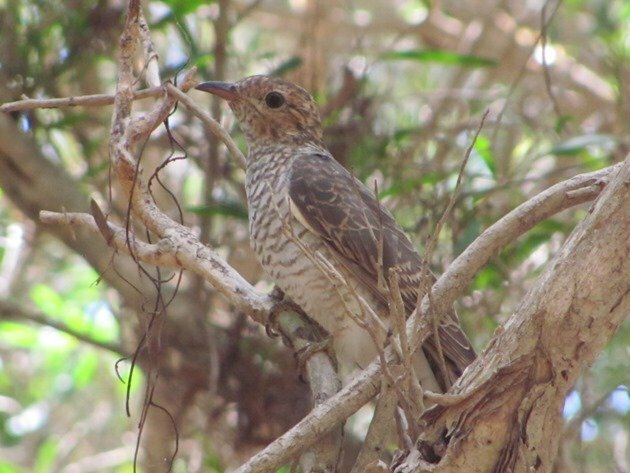 Around Broome we have Pallid Cuckoos, Little Bronze-Cuckoo, Oriental Cuckoo, Horsefield’s Bronze Cuckoos, Brush Cuckoos and Channel-billed Cuckoos. There is also the Pheasant Coucal, which is unique in the fact that it does not put its eggs into another species of birds nest, but sits on its own eggs and raises its own young. 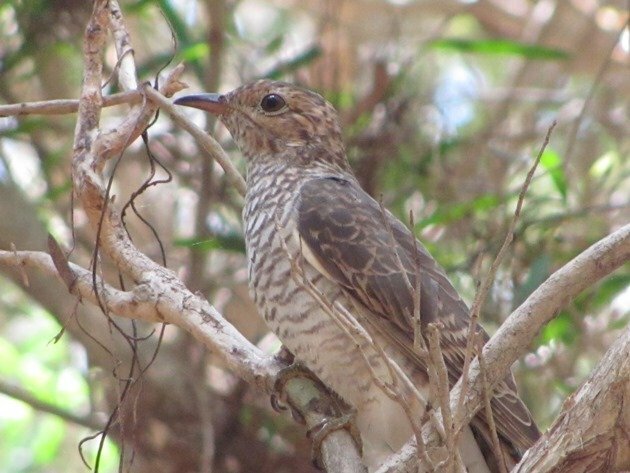 The Brush Cuckoo Cacomantis variolosus inhabits some of the paperbark swamps around Broome and usually when we encounter them we hear them or observe them briefly. On one occasion recently we were able to get a few minutes observing the bird which initially tried to look upwards as if it was trying to blend in with the environment, which it did well. It was a juvenile bird and no doubt its parents had used one of the many Paperbark Flycatchers nests to lay its eggs in. The Brush Cuckoo feeds high up in the trees generally and eats insects and caterpillars, which its host parents would have been doing initially. The call of this particular bird is a very shrill persistent call with between seven and twelve descending notes. Its flight is undulating and quite distinct. Once this bird reaches maturity it will be quite plain with a grey brown back, a grey breast washed buff and the tail will be quite square with white notches. The juvenile bird is a lot more colourful as above. Hopefully over coming months I will get the opportunity to not just hear the variety of Cuckoos around Broome, but observe and photograph a few more! What a wealth of cuckoos you have! Intrigued, I looked up the Brush Cuckoo call on the Xeno-Canto web site. Yup, it is shrill. And, rather uplifting. Feed me or I’ll die, and possibly take you with me!